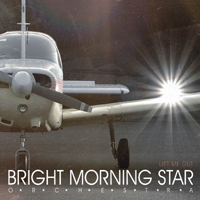 Bright Morning Star Orchestra could be the next big thing in Swedish rock! Their fine and polished rock music has the depth and quality to take a serious swing at bands like Coldplay, Muse or Mew. Wait a minute many might think now, what does this have to do on a metal website? Not much, unless you do like to listen to first class rock every now and then, because that is exactly what BMSO has to offer. The frontrunners in the genre have to look over the shoulder because this is a band to be reckoned with! Everything is made to last; the songs are strong, the musicianship is high, the production is good and they have created some memorable and timeless music for the masses. "Lift Me Out" is a solid effort, and I am sure it will help them gain a lot of recognition, so look out for this band if you like the bands mentioned above. And I am sure we will hear a lot more of them, all they need is the right amount of luck and support.